Happy Hump Day! Y’all, I finally turned the corner and am starting to feel like me again! I still sound like I have water in my nose but will take it as long as I feel like I am feeling! 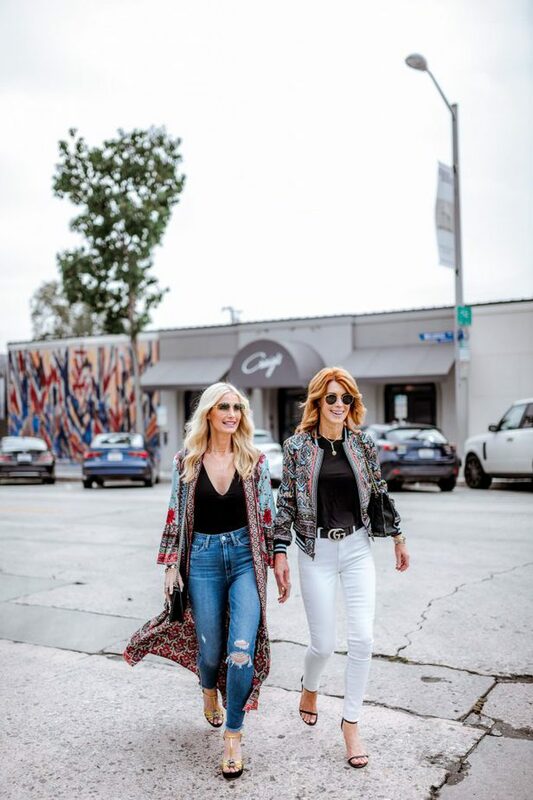 Heather (So Heather blog) and I saved this post in hopes that Neiman Marcus would have their Friends & Family Sale (25% off) and low and behold, it’s on! If you remember here, we took a girl’s trip to LA last month to play and to do a video with Rachel Zoe and the Box of Style. We wanted to do a post together and decided on the Alice and Olivia pieces we are wearing. Knowing that they were a little pricier, we are so excited that they are part of the sale. These two very similar yet very different pieces are amazing and worth the money! Why? Because they are both reversible! How fun are each of them? There is so much color and I’m sure will go with so many pieces in your closet. I love her kimono, but I liked the bomber jacket so much because of the evil eye print on the inside. It’s so much fun! We both ended up wearing black underneath our pieces, and I wanted to wear white jeans with mine. 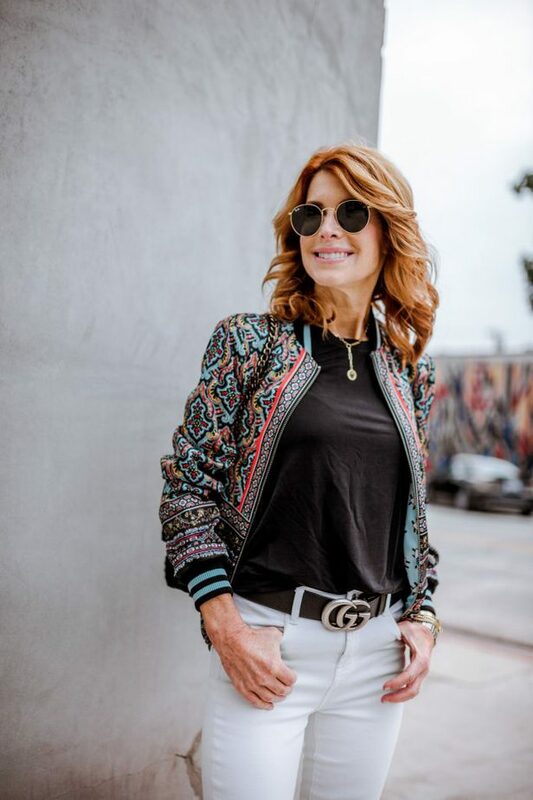 With Neiman’s Friends & Family sale going on, and so many great items on sale, now is a good time to grab a few things you might have had your eye on. This snake-print blouse I wore back in this post is on sale, as well as this snake-print tee I just bought last week. I also just purchased this beautiful blouse. There is so much! I’ve said it before, but one of the very best things about blogging is the amazing women I have met along the way. Heather is one of them. We met almost six years ago at a fashion event and became close friends in a hurry. She’s a lot younger, but we don’t ever feel an age difference. We are together a lot in Dallas and have traveled together more than a handful of times. We always get along and love the same things. She is one of my very best friends, and I am so lucky to have her in my life! We had such a great time on this girl’s trip. We went to some fun restaurants, shopped (more than we should have), and laughed a lot. We also got together several times with another one of my favorite bloggers, Janet, who lives in L.A. and is such a cool girl. Janet and I met at an event in New York and became fast friends as well. She is so interesting and one of the calmest people I’ve ever met, plus, she’s a huge cheerleader for everyone (that comes naturally because she was a former Dallas Cowboy’s cheerleader in the ’80s) Check out her blog here. Heather and I wanted to shoot this photo outside of our hotel (we stayed at the La Peer Hotel) and across from Craig’s. We went to Craig’s one night to try to get a seat at the bar, but no such luck. What was lucky, was while we were standing and waiting, we had the ultimate star sighting. Jennifer Lopez walked right by us on her way to the bathroom. She is drop dead gorgeous and has the most radiant skin I’ve ever seen. As she walked back by (bodyguard behind) her now fiance, Alex Rodriquez walked in and let me tell you; he is prettier in person. His eyes are mesmerizing! Share the post "GIRL’S TRIP TO LA AND FRIENDS & FAMILY SALE"